Savor the taste of a crisp Champagne or a fine wine paired with rich, decadent Guittard dark chocolate in a beautiful and unforgettable gift presentation. Your selection of wine or champagne, hand-dipped in gourmet Guittard dark chocolate. Dipped in Fine Dark Guittard Chocolate. Ribbon "Zipper" Releases the Chocolate Jacket from the Bottle. Note: This gift does not include wine glasses. Overnight delivery is suggested during summer months. Chocolate-Dipped Wine is a hand delivered gift. These gifts are delivered by one of our local design centers located throughout the United States and Canada. Same day delivery is available for most gifts when ordered before the cutoff time. The cutoff time for Chocolate-Dipped Wine is 12 PM in the recipient's time zone. Select a fine wine or champagne, dipped in premium Guittard chocolate. Arrives presentation-ready in an elegant organza gold bottle bag. Ribbon zipper releases the chocolate jacket from the bottle. Love Love the Chocolate Wine Bottle! I ordered a bottle of this wine to give for a gift exchange for Christmas. I wish I would have ordered one for myself! The shipping and packaging was exceptional! The company is excellent to work with and even called me to make sure my address was correct. There is nothing negative to say about the company or the wine. The chocolate on the wine bottle looks so good I was tempted to sample it! 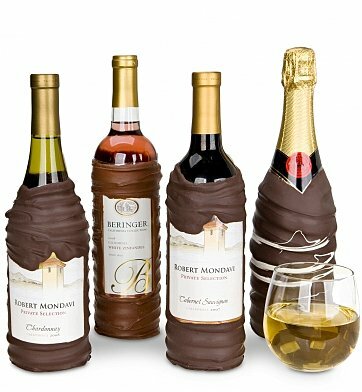 If you are looking for a unique gift, look no further and order a bottle of chocolate covered wine. I was on-line looking for a bottle of wine for myself, when I stumbled upon this site. When I saw the "Chocolate-Dipped Wine"!! I was so excited just looking at the pictures. So, I had an aunt how birthday was fast approaching and I didn't want to sent her the usually birthday card. So, since we usually like the same things... I decided to send her the chocolate -dipped Beringer selection. I had to pay extra for rush deliver, but she is worth it. She received it "ON" her birthday and she was so excited!! The only thing that could have made this better is if I could have sent it in gift basket. The associate said that it is only offer in the bottle. By, the way, I can't remember the associates name. (sorry) But, he was great. He took his time and he was very friendly. Can't wait to place another order for.. myself! "Where do you find these things?" was the first response from the birthday girl! She loved it! She sent me the picture of the plate with the cracked chocolate and 2 half filled wine glasses sitting along side. It appeared well received! Wow, this has got to be the best gift ever especially for your friend who has everything. I sent this as a unique gift for my daughter, and it was delivered too soon for what I ordered. After some initial miscommunication, where I thought my concern was ignored, it turned out the customer service staff was very concerned and helpful, actually arranging a replacement gift for the desired date. And I should say that my daughter was not upset about receiving the gift early. Her response was, "I love it. . . I can't believe something like this exists! It's beautiful!" So all in all, a success. I got this for my best friends birthday, she loved the presentation and overall gift. My daughter really enjoys these wines as gifts from Dad.. Unfortunately when I first ordered the Robert Mondavi Cab Sav covered in chocolate, they sent me a Robert Mondavi Merlot instead. I called GiftTree and spoke with an extremely nice employee who immediately called their vendor. I emailed the GiftTree employee a picture of the bottle to send to his vendor to prove it was the wrong bottle. In return, they sent me a whole new bottle with the correct wine. The customer service rep constantly followed up with me and made sure I received the bottle the next day. I don't think I've ever had better customer service ANYWHERE. In the end, even though I got the wrong bottle in the first place, it was no big deal because everything was solved and I was a happy camper because everyone was SO NICE. This was such a different gift from the usual wine baskets. I sent it for an anniversary gift and it was well received. The presentation was wonderful and such a surprise. The Champagne was delicious and so was the Chocolate. It peeled away from the bottle as instructed and went really well with the wine. Also, delivery was ahead of time and well packaged. Thank you Gift tree. Will order from you in the future. I didn't know what to expect because I didn't want it to look cheap. It was a novelty gift and I wanted it to look wonderful, which it did. I was extremely happy when it arrived, it came in a gold mesh bottle wrapper and the entire bottle was sealed over with plastic to protect the chocolate on the outside of the bottle. The white zinfandel came with a pink cap which added to the pink color of the wine. I WAS VERY PLEASED WITH HOW IT LOOKED AND WITH HOW FAST IT WAS DELIVERED TO MY HOME.....Thank you!! I sent this to my mother for Mother's Day and she was so delighted! Beautiful packaging, timely shipment, and such a unique gift. Another successful gift from GiftTree! Thank you! I gave this gift as a 30th bday gift. She loved it! She brought it to a party of 25 people who had not seen this gift idea and were impressed. The chocolate was very tasty. This is a great gift for someone difficult to shop for! I myself don't talk like this but my partners reaction to the gift was "Got the Gift, Freaking Awesome, Loved It!" LOL ..Thank you so much for your AWESOME idea and EXCELLENT delivery...I have a hard time trusting online buying and the mailing systems but you have FULLY gained my trust ..you have been saved to my favorites for future purchases. "Really cool!" is how the recipients described this gift of chocolate dipped bottles of wine. Arrived on time. Would send this again. Ordering process a bit complicated. There was no way for me to select which bottle of wine I wanted to send. It defaulted to one of the three wines available. So I had to place another order, which selected the wine I wanted, and then delete the first order. Receipient's comment was: It is beautiful. Champaign is very good.